The Student Manager function allows you to keep track of your report writing progress. 1. As you begin to type into a subject box you will notice the bars down each side of the box change from red to amber to indicate when you have started to write for this subject. We call these 'Completion Bars', when you have completed a subject you just click on the amber coloured Completion Bars which will turn to green (you can unclick this at any time). 2. 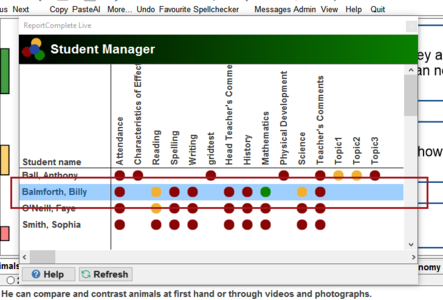 If you now open the Student Manager you can quickly check the subject status for each pupil (red, amber or green). 3. 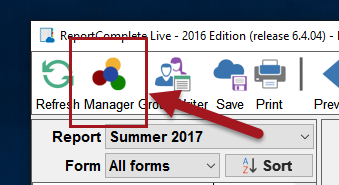 If you click on any of the coloured dots in the Student Manager grid you will be taken to that corresponding subject box in the report of the pupil you have selected. You can also use the Completion Bars to inform other teachers and your Headteacher that you have finished a particular subject in a report so they can proofread it and make changes if required. This page was last modified on 21 March 2016, at 11:36.